Many new fashion artists hide the hands by sticking them behind the figure’s back or by drawing shapes that looks like paws. But hands don’t have to be so hard if you use basic shapes and curves. Draw an oval for the palm. This oval should be a little less than 1/2 the length of your figure’s head. Draw a parallel curve above the oval to show where the fingers end. The distance between the curve and the top of the oval is approximately the same as the palm length. The total length of the hand is about 3/4 of the length of the head. 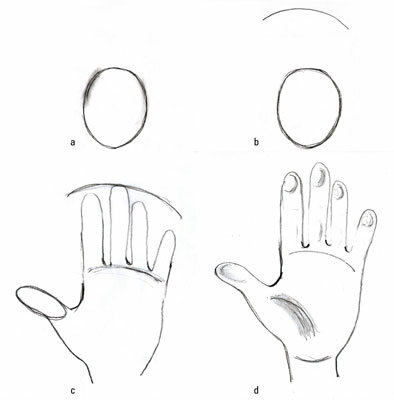 Lightly sketch in the fingers, using the top of the oval as the place where the fingers join the palm and the top curve for the fingertips. The middle finger is the longest finger, with the pointer finger as the next longest. The ring finger is slightly shorter than the pointer finger (or the same length as the pointer), and the pinky finger, of course, is the shortest. Add a cylinder-like shape for the thumb and shade for dimension. After you understand how to draw the basic hand, try your own hand at drawing a typical fashion model’s hand pose. One of the most common hand poses is a side view of the hand with a little fashionable bend to the fingers. Start with a circle for the elbow. For the forearm, draw a tapered cylinder that ends with a smaller circle at the end for the wrist. 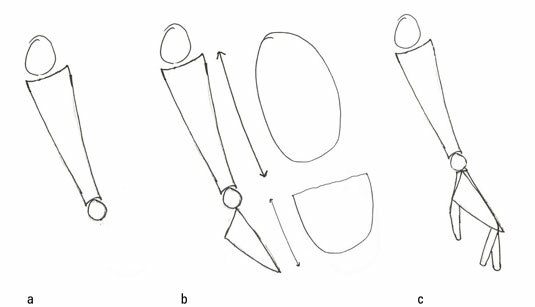 At the end of the wrist, draw a triangle shape with one point of the triangle touching the circle of the wrist. This triangle represents the hand, minus the fingers. The forearm is 1 head long, and the hand is about 1/2 head long. From the wide point of the triangle, add in a tube-type shape for the thumb. On the sharp point of the triangle, add two tube shapes bending from the end for the fingers.